What is Migraine and How Is It Treated Using Homeopathic Medicines? Migraine is a type of headache in which one half of head feels pulsating pain. This pain may last from 4 to 72 hours. Sometimes, some other symptoms are associated with this pain including vomiting, nausea and increased sensitivity to light & sound. Migraine is a neurological syndrome. It is more common in women, especially during or immediately after their menstrual cycles. The exact cause of this condition is unknown. But it is believed that migraine occurs because of dilation and inflammation of blood vessels present in the head region. This vessels dilation causes disturbance in blood flow to head area that causes the pain. Patient may be sensitive to some foods and when these foods are used Migraine attack may be triggered. For example, chocolates, coffee, tea, cheese, citrus fruits etc. Low Blood Sugar levels can also initiate migraine attack. High blood pressure is also a major factor. Improper sleeping habits can also be a cause. 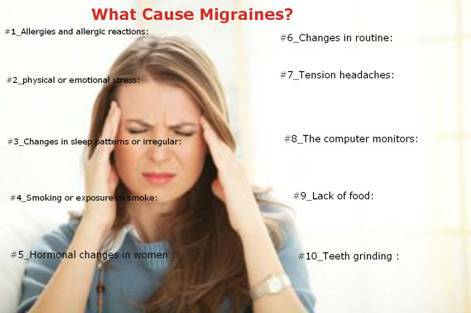 Hormonal changes may also cause Migraine. Migraine is more common in women especially during or after their menstrual cycles. The disturbance of hormonal levels, like estrogen and serotonin, is the main cause. How Migraine is Treated in Homeopathy? Homeopathic treatment of Migraine is considered as the best remedy because this treatment is effective, natural, safe and long-lasting. In homeopathy, medicine is given after studying the overall personality of patient. The medicines of one patient may be entirely different from others, although both may have very same symptoms. By proper homeopathic treatment the patient feels improvement after 2-4 weeks. Now patient will experience lesser pain attacks. Also these attacks will end sooner. After 4-8 weeks, the Migraine attacks are almost finished but the actual causes of problem are still existing inside patient. You should not stop the treatment at this time OR your problem may re-appear. For maximum results and 100% recovery 6-12 months may be required. I am 28 year female, from Sialkot. I have migraine pain (Headache) from my student life. Whenever this headache start in full head, it takes a day or two days. Some time it starts after a week, sometimes after 2 days. It is from last 8 years. I checked with different doctors, they are saying migraine pain does not have permanent solution. I heard in homeopathy, migraine pain have solution. I heard about a lot, that why I sending you this email. You are kindly requested to guide. If you really have something for my problem please reply me with mobile number. I will visit to you in clinic.